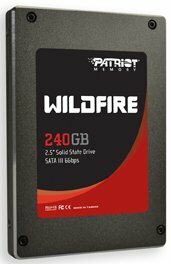 Patriot announced it's now shipping Wildfire series solid state disks with SandForce's SF-2200 processor. Patriot Memory, a global pioneer in high-performance memory, NAND flash, storage and enthusiast computer products, today announced it is now shipping their new Wildfire series solid-state drives powered by a new SandForce® SSD processor. The Patriot Wildfire series obliterates expectations of storage devices and delivers enterprise-like performance to consumer desktops and notebooks. The Wildfire series utilizes the new SandForce® SF-2200 processor enabling it to shatter previous SSD performance records with up to a blazingly-fast 555MB/s sequential read and up to 520MB/s sequential write speeds all backed by a SATA 6.0 Gb/s interface. "The Patriot Wildfire is the fastest SSD drive we have ever released," says William Lai, Patriot Memory's Product Manager. "Although we are a bit late to market, we wanted to ensure that the technology was rock-solid. We are confident with the latest firmware, Patriot’s reputation for quality and performance stand second-to-none." "We are happy to see Patriot Memory is expanding their current SandForce Driven™ product line with the new SandForce SF-2200 client SSD Processors," said Kent Smith, Sr. Director of Product Marketing of SandForce. "Patriot has won numerous awards and we anticipate they will win even more with our latest generation 6.0 Gb/s client processor."